Inclusion. The concept will likely figure large during President Barack Obama’s planned trip to Brazil, Chile, and El Salvador from March 19 to 23. This is so, not only for symbolic reasons (the U.S. President is a powerful symbol of inclusion and U.S. meritocracy), but also the significant advances and challenges of the countries he’ll be visiting on his first trip south of Trinidad and Tobago. Will he address it realistically or gloss over the ongoing challenges? While it is a complicated issue, fraught with the complexities of economic growth, race, and social policy, one policy prescription for improving economic and social inclusion stands out above all others: Equal access to education. Education has been demonstrated to be the single most important variable affecting social mobility. And who better than Obama—the biracial son of an absentee father who went on to study at Columbia University and Harvard Law School—to discuss the benefits of quality education? 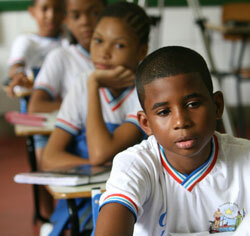 In recent years, the growth of the Latin American middle class, especially in Brazil, has been significant. But those gains are delicate and limited by race. More than a decade of stable economic policy coupled with social policy innovations has lifted over 40 million people in the region out of poverty in what was, and remains, the most unequal region in the world. These numbers are nothing to sniff at, but they belie the fragility of this new middle class. Most academic or technocratic measures of “middle class-ness” rely on measuring income, while most journalistic reporting on the middle class tends to cite these arrivistes’ access to credit. Neither really captures the security of the middle class. That it has grown is undeniable. But its definition and stability—not to mention its deeper meaning, given Latin America’s racial history—are open to debate. For one, tying the definition strictly to income or credit access obscures other more sustainable elements of modern-day (U.S. and European) notions of middle class: Namely, equal access to public and social programs such as quality education, health care, or pensions. So, what role can Obama play on this trip? For one, he should cite the significant social gains in the region, particularly in Brazil and Chile, which stand in sharp contrast to the ephemeral, politicized, and personalistic gains of countries like Venezuela. But he should also give mention to racially segmented Latin American society. Who better to address this topic than the U.S.’ first African-American president? Like it or not, social and economic status in the Americas all-to-often reflects race. Afro-Latinos in Brazil, Colombia, and Peru are overrepresented among the poor. The same is true of the indigenous. Let’s leave aside the notion of racism. Let’s look at the sinister overlay of poverty and race in which Afro-descendants or the indigenous too often lack the same access to the great solvent of social immobility: Education. A recent article by the Brazilian race and education expert Marcelo Paixao demonstrated, without intemperate accusations of racial discrimination, the relationship between race-based scholastic performance and school quality in Brazil. He found that Afro-Brazilian students consistently perform below their non-Afro counterparts when it comes to language and math scores. Not coincidentally, the schools that most Afro-Brazilians attend are significantly worse in terms of infrastructure and security than those attended by the majority of non-Afro-Brazilian students. Marcelo’s provocative piece shows that the division does not lie between public and private but across those schools; even the private schools attended by Afro-Brazilian students rank below those attended by a majority of students. The quality of education experienced by the indigenous, often based in far-flung rural areas in countries such as Peru and Brazil, faces the same constraints. In short, addressing historic issues of social and racial inclusion in Latin America requires confronting severe structural challenges: Schools of lesser quality, the location of the schools that serve those populations, and institutional and financial obstacles faced by governments when it comes to reaching those populations and locations. I hope that President Obama can begin to point out these fragile inequalities as problems shared by our countries and by nations confronting a history of servitude and slavery. The type of meritocratic advancement that allowed the U.S. president to rise through educational channels to become the chief executive is unthinkable in many countries. Fortunately, the structures are changing. Brazil’s last president, Luiz Inácio Lula da Silva, a former machinist with a grade school education, rose through the union ranks to lead his own country. But in Brazil—as in Chile, El Salvador, and the United States—inequality of opportunities persist. The president’s presence in Brazil, Chile, and El Salvador will offer a powerful way to convey social inclusion as an American value. Already we’ve heard Secretary of State Hillary Clinton talk about it. Now the task will be to point out what it means in practical, sustainable terms. In a changing region, the United States has a lot to show its partners south of the Rio Bravo. But it also has a lot to learn. This is one area where the U.S. president, free of rancor or condescension, can talk about our shared challenges and ways to address them. One concrete way he can do that is to aggressively implement and expand the goals set out in the Joint Action Plan to Eliminate Racism and Ethnic Discrimination and Promote Equality signed under the George W. Bush administration. http://www.state.gov/p/wha/rls/2008/111446.htm Despite the name, little action has been taken. The president’s trip is the moment to not only set it into motion and broaden it, but also to give it the public, regional attention the initiative deserves. (When it was signed it barely made a ripple in the news.) Within the program’s broad education initiatives, special attention is paid to exchanges with community colleges and vocational schools. But, as the Paixao study cited earlier proves, that is not where the problem starts. Instead it begins earlier, with the lack of access to quality primary and secondary schools; by the time Afro-descendant citizens reach college level they have already started with a handicap. But more than addressing the issue of unequal educational opportunity at its roots in Brazil, Presidents Obama and Rousseff should use this opportunity to jointly engage the rest of the hemisphere in this effort. As Brazil moves to become a leader and symbol of economic development and social progress, it should work with other countries with significant Afro-descendent populations such as Colombia, the Dominican Republic, the United States, and, yes, even Cuba to promote cultural dialogue, scholarships, and educational exchanges. In fact, Brazil may be able to provide a bridge to tackle an often overlooked issue in Cuba—race as a barrier to economic opportunity—and can help loop in U.S. scholars and students. President Obama recently paved the way for greater cultural and educational exchanges with Cuba. American middle-class university students and hand-selected Cuban students and scholars will make up the majority of those who take advantage of the opportunity. Imagine the potential should those exchanges be opened up to include a third country and focus on distinctly race-based themes. In short, as President Obama makes his way through Latin America and stops in Brazil, he should do more than just capitalize on his life history as a symbol of U.S. social mobility. He will need to demonstrate the U.S. commitment to this issue. An easy step is increasing race-based scholarships and exchanges initiated under his predecessor. A more difficult one is to propose creating a broader coalition of nations that can promote social and racial inclusion through scholarships and exchanges, all based on a simple, but powerful, idea: quality education for all. Perhaps it’s an idea that’s too much to hope for. But I can hope, can’t I? That, at least, is what I learned in 2008.